The bookmakers have already had a result for this Saturday’s Betfred Ebor Handicap as several of the best-backed horses in the ante-post market have been withdrawn through injury or because of the fast ground. Original favourite Stencive and well-backed second favourite Pallasator along with Harris Tweed, Cambourne and Well Sharp are all absentees. Clear favourite is Sir Michael Stoute’s Royal Ascot winner Opinion who will be the mount of Ryan Moore. He followed up his Ascot victory by running an unlucky fifth in the competitive Old Newton Cup at Haydock. Opinion runs in the colours of Highclere Racing who enjoyed success earlier in the week when Telescope won the Great Voltigeur Stakes impressively. The fast ground should not hold any fears for the four-year-old but he is yet to race beyond a mile and a half. Opinion is a strong 5-1 favourite with Bet365. Sun Central has been a leading contender for this race since winning by three and a quarter lengths over course and distance last month. He holds several of his rivals on that form but his cause has not been helped by being left to shoulder top weight. 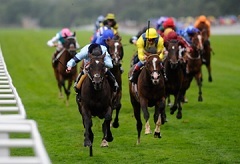 Roger Charlton suffered a setback in midweek when Al Kazeem could manage only third in the International Stakes. He hopes to end the week on a positive note with Bishop Roko, a lightly-raced improving son of Rock of Gibraltar. He is closely weighted with Genzy on Ascot form where the pair were separated by a head over a mile and a half. Lady Cecil’s Tiger Cliff narrowly failed to land a gamble at Royal Ascot and will be having only his third start of the season here under Tom Queally. He has gone up 4lbs in the handicap since his last run and is 10lbs higher than when winning here in May. David O’Meara’s Tropical Beat made an eye-catching reappearance when second at Musselburgh recently and could spring a surprise. That was only his second start at this distance having finished second to Sir Graham Wade at Haydock last season. Mark Johnston’s horses are in fine form recently and Oriental Fox was denied in the shadow of the post in the valuable Northumberland Plate earlier in the season. He disappointed at Goodwood but ran a fine race at Ascot at the Shergar Cup meeting and could run a big race at a huge price. David Simcock had high hopes for Montaser at the start of the season but he has run below his best in his last two starts. He won well here in June and is accompanied by better-fancied stablemates Sheikhzayedroad and No Heretic.